Did Nigerian Ministers Abandon Investor Summit in Washington DC? 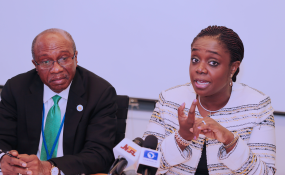 Minster of Finance, Kemi Adeosun and Governor of Central Bank of Nigeria, Godwin Emefiele. President Muhammadu Buhari's attendance of the Commonwealth Heads of Government Meeting (CHOGM) in United Kingdom, which came at huge cost to the nation, was a colossal waste. Nigerians are not surprised that the President returned last night, empty handed and with no tangible dividend, a development which is the direct consequence of his negative comments about Nigerians and his presentation of false performance indices to his hosts. While other commonwealth heads of state used the occasion to negotiate businesses and showcase the potentials and opportunities in their countries, our President only succeeded in de-marketing our dear country and painting our citizens, particularly the youths, in the negative. Theresa May, President Buhari, in the quest to hide the failures of his administration and push his 2019 re-election bid, Mr President downplayed the worsened economic and security situation in the country under his watch, but opted for self praise and brandishing unsubstantiated record of performance. This self-serving stance ultimately blocked all beneficial bilateral engagements that could have helped secure the much needed international interventions in those critical areas. Two days after, President Buhari again took the stage at the Commonwealth Business Forum in London and announced to international investors that Nigerian youths, a demography that forms the bulk of our nation's workforce, are uneducated and lovers of freebies. We were therefore not surprised that no serious investor sealed any meaningful investment deal with Nigeria as dividend from the CHOGM. It is also instructive to note that despite the public outrage that trailed his denigration of our youths, the Buhari Presidency has not offered any apology to the nation, particularly our youths, thus further confirming the disdain in which this administration holds our young men and woman. Having returned from CHOGM with nothing but wasted opportunities, the next move by the Buhari Presidency would be to hugely mobilize their spin-doctors with public resources and direct them to inundate the media with claims of imaginary gains in an effort to befool Nigerians. Nevertheless, while we request the Presidency to immediately make public the cost of this trip on the national coffers, we note that the All Progressives Congress (APC) and its Federal Government have irredeemably failed and can no longer represent our interest and aspiration as a nation. Nigerians must therefore unite to save our nation from imminent collapse by rallying with the repositioned platform of the PDP to enthrone a purposeful and people-oriented government, come 2019.